Other Helpful Info to Make Ordering Easy! We offer so many options for customizing your invitations, almost all for free! You can mix and match the front of one design with the back of another to create the perfect invitation. You can also change the ink colors on most of our designs including virtually all of geometric patterns. Add Hebrew, change your wording, choose from our 6 premium paper options - all for free! Once you’ve worked out your details, you can conveniently place your order online, at your leisure. If you're short on time, no worries! Our order form will save your progress each time you click the next button so you can pick up where you left off. Once you’ve given us your customization details, you will place your $95.00 deposit and we can begin working on your first set of proofs. At the end of your order form you'll have the option to schedule a quick phone consultation with one of our Invitation Specialists. We'll do our best to make this a fun and easy process! Final payment is not due until you approve your proofs to print. You can also change your final quantities up until you approve your final proofs. 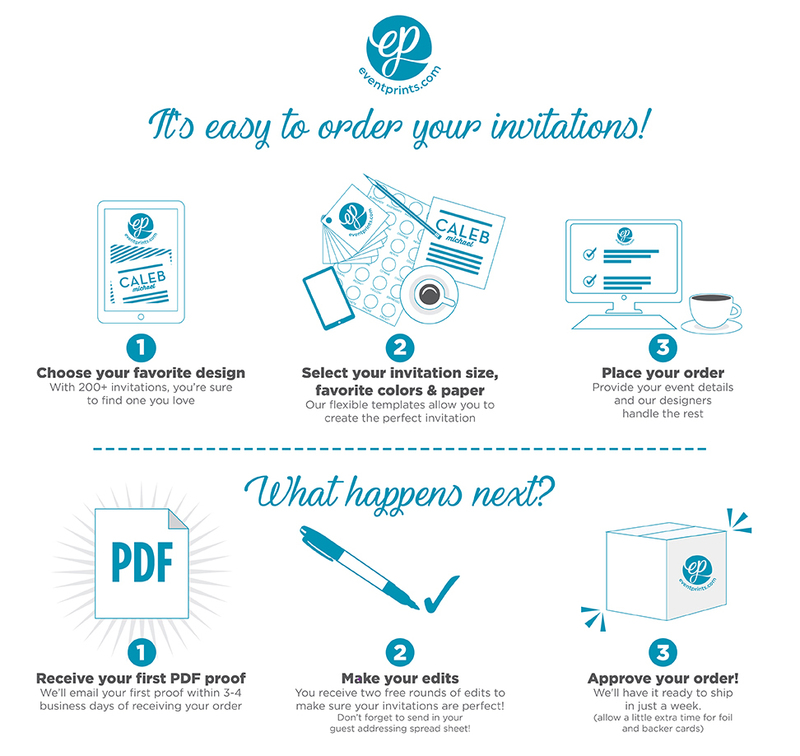 Within 3-4 business days, you will receive your first customized proof through email. Be sure to carefully review each element of your invitation, especially spelling and dates. It's easy to miss items, so we suggest several people help with proofing. Once you've had a opportunity to review your proofs, submit your first round of edits through the link in your proof email. We provide two complimentary rounds of edits after your initial proof to ensure your invitation is absolutely perfect! In the unlikely event you wish to cancel your order, you may do so before making any edits and receive a complete refund of your deposit. Once you submit your first round of edits, your order may not be canceled and your deposit is non refundable. If we are printing your guest addresses, use the link in your proof email to submit your spreadsheet to our proofing department. You’ll receive a PDF proof of each envelope with your guest's information for your review within 24 business hours. You receive one complimentary rounds of edits with your order, so spend extra time before completing your free editing round to make sure you don't omit anything. When you are ready to approve your order, simply click the button in one of your proofs that says “I’m ready to approve my proofs for printing.” This form is where you will select each item you wish us to print and let us know the quantities for each. Once you approve your order, we will have it ready to ship in just 5 business days, or one calendar week (some items, such as printed backer cards or foil, will add production days). We will also email you a final invoice prior to shipping which you can conveniently pay online with a check or credit card. Your hard work is done! All that’s left is to stuff, seal, stamp and mail your beautiful invitations. We know your guests will love receiving them!